Jay-Z is set to perform at the grand re-opening of New York City's legendary Webster Hall on Friday, April 26. The 133-year-old building has a long and storied history going back to the 1800s, but it was only after being re-opened and restored in 1992 that Webster Hall emerged as one of the most popular and successful clubs in the world. After it was purchased by Brooklyn Sports Entetainment, a division of AEG, it closed in 2017 for renovations. Now, a series of A-list talent is booked as the venue looks to reassume its place as the premiere downtown club in NYC. In addition to Jay-Z, other big name acts booked include Vampire Weekend, Sharon Van Etten, Patti Smith, Broken Social Scene, MGMT, Big Thief, and Chris Robinson Brotherhood. For the special opening performance, Jay-Z will do a set of "B-Sides." It only seems fitting that Hov was tapped, because he is among the most successful NYC-born artists in history, and he did a 12-night run to open the Barclays Center in 2012. At this time, Jay-Z's only other scheduled date is at the Woodstock 50 festival this August. Stay tuned, we will be updating this page if additional information becomes available. 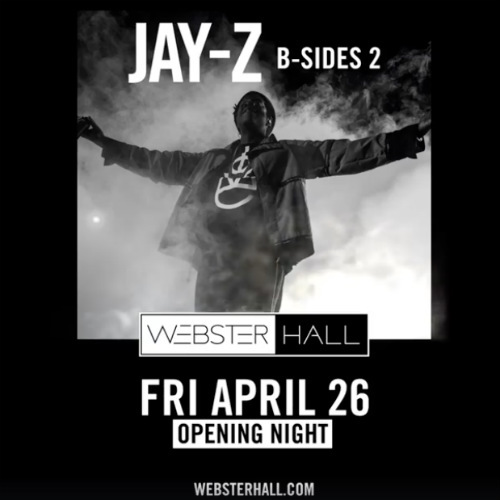 When do Jay-Z Webster Hall tickets go on sale and what is the presale code? The general public on-sale begins on April 19 at 11 am local time. Presales for American Express cardmembers will begin on April 18. For the American Express presale, you can use the promo password INGOLD, but you will need the card to complete your purchase. Keep in mind, each date is different and details are subject to change. Click through the individual concert links for more information about the show you're interested in. We recommend following Jay-Z on his social media accounts, in addition to signing up for your local venue's email newsletter, to get the most up-to-date information. For concert tickets and more, check out Jay-Z's Zumic artist page.